The JOBS Act: The appalling bill that would repeal essential Wall Street reforms. The appalling bill that would repeal essential Wall Street reforms. 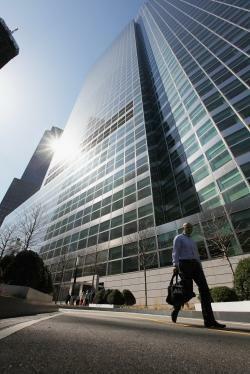 Goldman Sachs headquarters in New York City. Former Goldman Sachs executive director Greg Smith wrote a scathing editorial about the company the New York Times. Once again, the Puppets on Capitol Hill are about to slam the Muppets on Main Street. The country still hasn’t recovered from the Wall Street-induced financial cataclysm of 2008, yet Congress is preparing to enact the Orwellian ”JOBS Act”—a bill that should in fact be called the “Return Fraud to Wall Street in One Easy Step Act.” The bill will undo some of the most important reforms placed on Wall Street in a generation. Ten years ago, virtually all of the major investment banks on Wall Street were charged with a monumental deception of the American investing public: touting stocks as great investments when in truth the banks believed the stocks to be “dogs,” “pieces of —-,“ and worse. The banks did this because of the conflicts of interest woven into their business model. They were underwriting the very stocks they were also touting, making the investing public dupes helping the banks generate enormous fees. At that time, the investment banks’ defenses were as astonishing as they were revealing. First, they claimed “everybody knew“ that analysts’ recommendations were worthless because of the enormous hidden conflicts—admitting that no rational, knowing person would rely on the advice investment banks were sending to tens of millions of small investors. This, of course, would have been news to the investing public. And then—even more disturbing—they rationalized that such deception was acceptable because they were not as bad as their competitors. In a world of relativism, “not being the worst” was in their minds a sufficient defense to market frauds. An industrywide resolution in 2003 forced structural changes designed to end some of the conflicts of interest. This was a small step forward in the fight against a deregulatory philosophy that then reigned in Washington and on Wall Street—a philosophy that had made Wall Street’s “masters of the universe” fabulously rich and powerful not by virtue of intellect or creativity but by exploiting conflicts of interest to trade against their clients, leveraging information not available to others, and generally disregarding the importance of upholding the integrity of the marketplace. In the years following the analyst settlement, structural flaws of equal magnitude were revealed in the mutual-fund industry, the insurance marketplace, and the subprime debt industry. The public rightly demanded reform, and some was implemented. Has it been sufficient? Not nearly. Recently we have seen Goldman Sachs forced to pay hundreds of millions of dollars for its role in the Abacus transaction—the sale of subprime debt that was packaged and designed to fail—and Goldman roundly chastised by a court for its conflicted role playing every side against the other in the $20 billion Kinder Morgan transaction. While Goldman might be the most high profile of the banks, the nature of these transactions and the conflicts they highlight continue to permeate the entire industry. So how has Wall Street responded? By continuing to recite the oldest and most flawed Wall Street mantra: Trust us, we can regulate ourselves, and please repeal even those few structural reforms imposed upon us. Which brings us to the JOBS Act. The bill that has already passed the House will remove the critical protections imposed in the analyst settlement a decade ago with respect to companies with revenues of less than $1 billion per year, allowing them to return to the fraudulent practices of yore. Did the House conduct any meaningful hearings before it voted on this issue? No. Did Congress inquire about the long-term harm to the capital markets that resulted from the fraud committed by these very banks when they were free to act as they now want to once again? No. Congress merely responded to the commands of Wall Street capital. While the Senate will consider several amendments to the bill this week that might provide marginal improvement, there is only one real answer: Defeat the entire bill. The notion that Wall Street needs regulatory relief—rather than greater structural reform—is simply wrong.